Cruelty-Free & Vegan Holiday Gift Guide! Vegan Cookbooks. Everybody cooks, right!? Vegan cookbooks make the perfect gift for friends, family, neighbors, co-workers, in-laws and even your mailman. And with literally thousands of vegan cookbooks on the market, you can find one that suits absolutely anyone. The health nut . The baker . The artisan cheese lover . The college student . The gourmet foodie . Everyone. 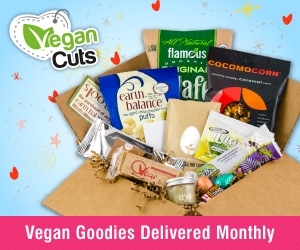 Vegan Cuts Subscription Boxes. 2013 has been the year of the subscription box. They’ve become the hottest new thing, and for good reason! Who can pass up the opportunity to receive a package of surprise vegan gifts on your doorstep each month!? 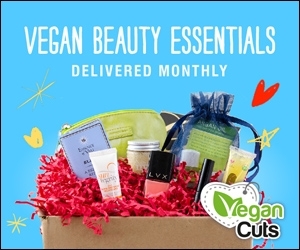 A one-month, three month, or six-month subscription to the Vegan Cuts Snack Box or Beauty Boxcan make the perfect holiday gift that keeps on giving. Sweets. Whether you go for chocolate, caramel or baked goodies, nothing makes a holiday sweet like vegan treats! Sjaak’s offers great vegan holiday chocolate boxes which are discounted at Vegan Cuts! Cinnaholic can ship freshly baked cinnamon rolls with your choice of frosting flavors anywhere in America. And finally, Obsessive Confection Disorder makes magical treats like Caramel Not Corn, “Winter Woof” (peppermint bark), and Vanilla Bean Caramel Sauce. NOM. T-Shirts. Every vegan loves rockin’ a sweet animal rights message on their tee. My two favorite T-shirt companies are Herbivore Clothing Company and Compassion Company. Go get ‘em! Vegan Vine Wine. Oh yes. The most beautiful wine in all the world: The Vegan Vine . Perfect for dinner parties, a romantic holiday winner with your honey, or to tie with a ribbon and place under the tree. This entry was posted in All Videos, Book Reviews, Product Reviews. Bookmark the permalink. ← SF Green Festival ★ Vegan Style!